GENEVA, Ill. -- On your mark, get set, GO! Runners and walkers can now get registered for the sixth annual Northern Illinois Food Bank Foodie 5K race series, which is a fun annual tradition to help fight hunger in our community. 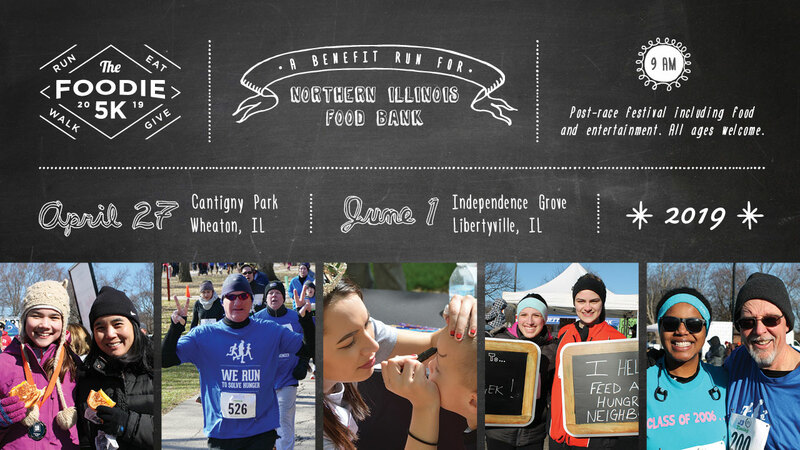 The Foodie 5K race series benefits Northern Illinois Food Bank and is anticipated to involve more than 2,000 runners and walkers to their races in Wheaton and Libertyville. Each event features a post-race festival with entertainment, free food tastings from local chefs, area restaurants and vendors and an interactive Kid's Zone, offering a great day for families, leisure walkers and competitive runners alike. Last year, the Foodie 5Ks attracted more than 2,400 participants and raised more than $192,000 to support the Food Bank's efforts of solving hunger across its 13-county service area, which helped provide more than $1.5 million in groceries for hungry neighbors. "The Foodie 5K races are a great way to bring competitive runners and casual athletes together for a common cause - fighting hunger in our communities," said Kate Thomas, Special Events Coordinator at Northern Illinois Food Bank. All proceeds benefit Northern Illinois Food Bank, where every $1 donated provides $8 worth of groceries. Participants are encouraged to fundraise leading up to the event in order to help the Food Bank feed even more hungry neighbors. "Since its inception, the Foodie 5K race series has raised more than $1.1 million, which has helped provide an impressive $8.9 million worth of groceries to neighbors right here in Northern Illinois," Thomas said. Both races are chip-timed fun runs/walks open to all ages. Registration is now open and available through race day. Participants registering for Cantigny before April 12 and/or for Libertyville before May 17 will also receive an official race t-shirt. Registration per race is $35 for adults and $15 for children ages 6-12. Children ages 0-5 are free. Those registering for the first race will also receive a $10 discount offer for the second race. Volunteer and sponsorship opportunities are available for both races. Visit www.SolveHungerToday.org/Foodie5K for updates on participating food vendors, entertainment and activities for kids at both race locations. Northern Illinois Food Bank, a member of Feeding America, is a non-profit organization that engages the community to solve hunger in Northern Illinois. Manufacturers, local groceries, corporations, foundations, and individuals come together to donate food and funds, and evaluate and repack food for distribution to more than 900 partner feeding programs - the food pantries, soup kitchens, shelters and youth and senior feeding programs that serve more than half a million people every year. Northern Illinois Food Bank has centers in Geneva (West Suburban Center), Park City (North Suburban Center) Rockford (Northwest Center), and Joliet (South Suburban Center). Find out how you can volunteer, donate or get involved at www.SolveHungerToday.org, or follow us on Facebook, Twitter, Instagram and LinkedIn.